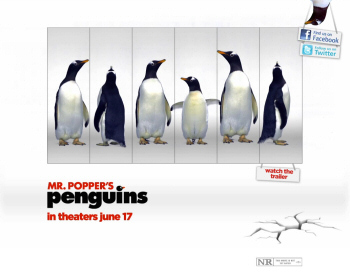 Jim Carrey's upcoming movie "Mr. Popper Penguins" has an official website now. You can watch the first theatrical trailer for the movie and meet the six cute penguins. Loudy, Lovey, Bitey, Nimrod, Captain and Stinky. Her favorite sports are football, and slipping-and-sliding on her belly -a skill she was pretty much born with. The website also offers all Jim Carrey fans to join its Twitter, Facebook and YouTube pages. There is still much more to be added on the website in order to make it more interesting and attractive. Definitely a good start for the promotion! I guess this is the Turkish version? you saw more of the film on it. Who else feels the same way? @Fluffs there is a link there tho. Click it and it will take you to the video. Its the same as the german one but with the Turkish language. Yes! I found the english version of the full video trailer. The official website is finally online. Looks good. TNPihl wrote: The official website is finally online. Looks good. Post your Penguin Dance here, lets see eachothers dance. TNPihl wrote: Post your Penguin Dance here, lets see eachothers dance. No, no, no... Can't dance... Wish I did!